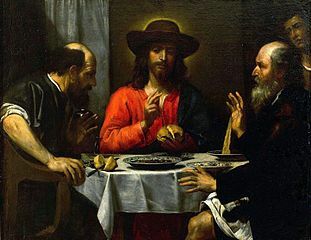 13 That same day two of Jesus’ disciples were going to the village of Emmaus, which was about seven miles from Jerusalem. 14 As they were talking and thinking about what had happened, 15 Jesus came near and started walking along beside them. 16 But they did not know who he was. 22 Some women in our group surprised us. They had gone to the tomb early in the morning, 23 but did not find the body of Jesus. They came back, saying that they had seen a vision of angels who told them that he is alive. 24 Some men from our group went to the tomb and found it just as the women had said. But they didn’t see Jesus either. 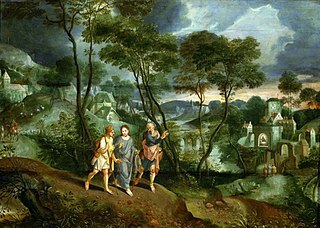 28 When the two of them came near the village where they were going, Jesus seemed to be going farther. 29 They begged him, “Stay with us! It’s already late, and the sun is going down.” So Jesus went into the house to stay with them. 30 After Jesus sat down to eat, he took some bread. He blessed it and broke it. Then he gave it to them. 31 At once they knew who he was, but he disappeared. 32 They said to each other, “When he talked with us along the road and explained the Scriptures to us, didn’t it warm our hearts?” 33 So they got right up and returned to Jerusalem. We were walking along. Still discussing. Still wondering. Still trying to work our what it was all about. What a roller coaster few weeks, well years really I suppose, what a whole range of emotions. We really needed to work out what this meant for the rest of our lives. Then someone else appeared. A fellow traveller, going the same way. He asked us what we were discussing – seemed very interested (though I don’t know where he’d been because he didn’t seem to know anything about what had happened!). So we told him. All about Jesus. What he had done and taught; what he had meant to us; how he’d been tried and sent to crucifixion; and then the tales of his resurrection. We told him how our hopes had been dashed, how we’d hope he was the one to save Israel – from itself and it’s tyrants – but it wasn’t to be; then our surprise and our confusion. This man seemed to know something. He wondered why we were surprised, why we couldn’t understand what had happened, even realised it was part of the plan… He certainly knew all about the Law and the Prophets, he gave us an impromptu bible study on everything written about The Messiah. Well that wasn’t the end to the day that we were expecting. We were drawing near to our destination. Truth be told, we’d be glad to get there, sit down and have some sleep. All this emotion is exhausting. But it seemed rude not to invite him in. Somehow we had formed a bond on the road. He seemed to be going somewhere else, but we begged him to stay with us. He came with us and we sat down to eat. And then the penny dropped. As he took the bread, it all became clear. Only one person breaks the bread like that. Jesus was still here with us. On our journey. In our home. With us in our conversation and our wondering. Jesus has not gone on. He is here with us.